Copies of current and past issues of the VMHB are available from the museum shop for $4.00 each, plus $8.95 shipping and handling. Please note: Issues are not available for purchase online, though e-mail inquiries are welcome. 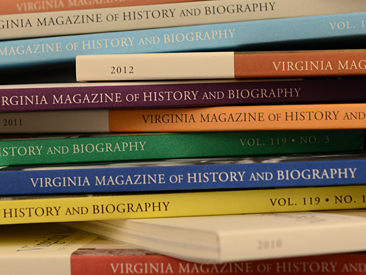 Virginia Historical Society members at our general levels can purchase a print subscription to the VMHB for $12 (not tax-deductible). Please note that Benefactor, Associate, and 1831 Society* members receive the print subscription for free. To upgrade your membership, click here. *Donors whose annual gifts total $1,000 or more are recognized as members of the 1831 Society (our founding year).